House near completion at week 6. Building your most valuable asset, your home, today can be a challenge. A challenge, not only as a result of the spiralling cost of materials and labour, but also because of the culture in the industry, where quality workmen are hard to come by, along with the prevalence of corruption on building sites. This makes our offer the superior option. We are pleased to offer you The EGO Building System, where the large number of workmen and the conventional materials such as cement, sand, stone, lumber, etc. are not placed on site exposing them to theft. Our system allows for completion of your build on own land unit in approximately 6 - 8 weeks in Jamaica. To provide strong, affordable, turnkey residential build-on-own-land solutions to the Jamaican land owner completed within 6 to 8 weeks that will last a lifetime. Who really has the time in Jamaica to hassle with red tapes and endure long lines! 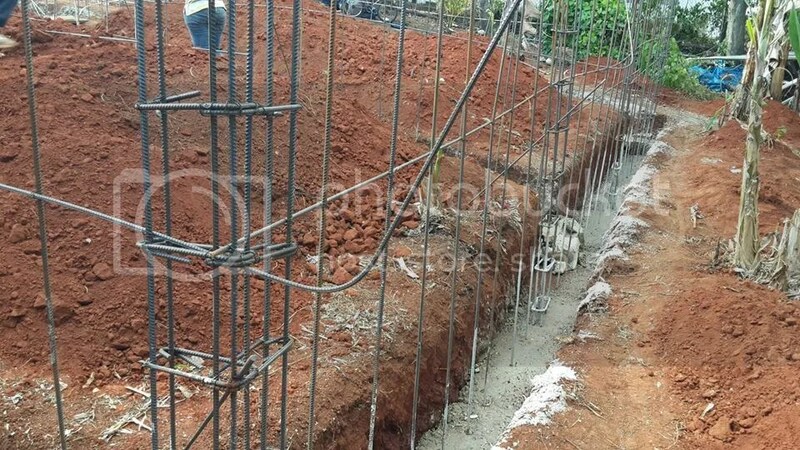 From inception to completion, we handle the design, planning, procurement, construction, manufacturing and installation for you- this in a short time span of about 6 to 8 weeks. Our products are reliable, functional and aesthetic, meeting the highest international standards. Owning one of our beautiful homes that is built on your own land is as simple as providing accessible land, choosing your model of choice, financing the purchase and we install your home in an approximately 6 to 8 weeks completed once the unit begins to arrive on site: Yes your dream home is only 6 to 8 weeks away from the start of the building project. 2) Deposit J$20,000 for site inspection to examine the terrain of your land, the soil type and accessibility, etc. (The inspection will be done within 14 days). This deposit is non refundable. Research the likely cost of land, architect fees, builders, materials, fixtures, fittings and everything else you will need when you build a property from scratch. Look at your finances and decide whether you can cope with such a huge financial commitment. Consider ongoing costs, such as if you will be able to afford to pay rent or a mortgage while working on the construction.If you look carefully at the new housing developments in Jamaica you will see a trend of people starting a house and then taking forever to complete. This is mostly due to them not having a budget. 5) Secure your NHT, Building Society, Bank or other commitments to finance the project. 6) The work will commence within two (2) weeks after the approval of the local Jamaican Parish Council (subject to the availability of the client funds for construction). The work will be completed within 6 – 8 weeks thereafter, all things being equal. The KSAC. Interests is also being shown by the National Housing Trust (NHT) and numerous professionals, contractors and home buyers. We are working in conjunction with the NHT and all major building societies and financial institutions. The EGO Building System is an innovative low cost building system that aims to cut the price of the conventional block and steel unit of the same size by 30-35% and can be erected in less than 25% of the time it takes to erect a block and steel unit. The materials used are specialy designed cement fiber board which is a High grade, high density cement fiber board manufactured to be fire resistant, water resistant, and termite resistant. Now being used in North America, Canada and in the eastern Caribbean, this amazing material is used not just to build low income houses but commercial buildings, churches, schools, offices, warehouses and multistory buildings. The material is environmentally friendly and is indeed a Green Product. EGO BUILDING SYSTEM is designed to withstand winds up to 150 mph and will stand up to earthquakes and other acts of God similar to conventional steel buildings. The strength of ego building system is to be found in the structure of the building which can stand alone and is made from galvanized steel, track and stud of sizes and strength to meet an acceptable standard. All other materials used are conventional and approved by the relevant authorities, building contractors, Jamaica Bureau of standards etc. Potential homeowners can choose to finance through one of our local financial institution of their choice. Institutions such as the National Housing Trust, the Victoria Mutual Building Society, Jamaica National, and the St Catherine Cooperative Credit Union, COK, and National Commercial Bank etc. all have financial plans for homeowners looking to build on their own land in Jamaica. We suggest you contact the NHT first as they usually have the best rates for build on own land projects. House completed in 8 weeks. Tiffany Gordon, mortgage sales executive, JNBS, says the build on own land (BOL) concept is one that is welcomed by the local housing industry given the price tags associated with these homes. She also notes that the concept will provide land owners with the opportunity to increase their investments. “At JNBS, we recognise that Jamaicans are looking for more affordable housing options. The economic climate has no doubt impacted on the housing sector due to the limitations on investment capabilities and disposable incomes. And, there, this build your home on your own land concept is an incredibly innovative solution for affordable housing for Jamaicans, once in ownership of land,” Miss Gordon stated. If you have not purchased the land as yet then finding a plot of land for your new home is the first and often the most crucial decision you need to make. There is a good chance that you will already have an idea of the area in which you want to live, but it is still worth doing a bit of investigation before looking at specific plots: if you are planning to be a one of the new home builders in Jamaica. If you have a young family you should also check the local schools’, clinics and other areas when you decide where to buy land. She also noted that, there are many persons who have small land holdings, who would like to develop on their investment, whether for personal use, or as an income generator. This build on your own land in Jamaica concept is certainly encouraging for prospective home owners who are legally owners of lots. Recognised by leading building societies and financial institutions, the build your house on your own land housing units are featured in–studio, two bedroom and three bedroom structures, which can accommodate customization. The structures are built to withstand natural disasters and are said to be ideal for areas with steep terrains. The low income housing development is a raidly expanding market for homeowners looking to build their dream house on their own land in Jamaica. Here is the article from the JIS. Minister with responsibility for Housing, Hon. Dr. Morais Guy, has informed that work has already started under a programme, which will see Food for the Poor constructing and selling houses to the National Housing Trust (NHT). The collaborative project, which involves the Ministry, Food for the Poor, the NHT, and the Jamaica Emergency Employment Project (JEEP) Secretariat, will benefit low-income earners. Speaking at a post-Sectoral Debate press briefing at the Ministry’s offices in Kingston on Friday, May 10, Dr. Guy disclosed that some 77 units have already been built in Hampden, Trelawny. “We’re going to be building an additional amount in Meylersfield in Westmoreland, which will take the initial number to 102,” he further informed. The programme, which was initially announced by the Minister of Transport, Works and Housing, Dr. the Hon. Omar Davies, during the 2013/14 Sectoral Debate in the House of Representatives on May 7, will see Food for the Poor constructing some 600 concrete housing units (360 sq. ft. each) annually for sale to the NHT. The houses are to be constructed for the equivalent of US$9,500 per unit and will be made available to NHT contributors who earn a weekly salary of between $5,000 and $7,000. Dr. Guy said the government is earnestly moving ahead with the project, which represents an opportunity to respond to the needs of low-income NHT contributors. “We are also earnestly looking at lots scattered all over the island, which can accommodate these units. We have a Memorandum of Understanding (MoU) with the NHT to deal with this,” he said. Dr. Guy further noted that the programme will take into consideration those contributors, “who have their own land and can build on those lands.” He said the units would be built at a lower cost under those circumstances. 1.1) WHY SHOULD I BUILD WITH STEEL ON MY BUILD ON OWN LAND DEVELOPMENT? Residential Steel Framing members are cost effective, light weight, easy to handle, and manufactured under strict quality control guidelines. Steel framing is also termite proof and non combustible. Steel is the most recycled product in USA as well as all around the world. It is a green product. Your maintenance costs are minimal, your insure cost is reduced. These are some of the many different advantages of building with light gauge steel. For additional advantages visit our web site. 1.2) WILL THE STEEL MAKE MY HOME LOOK DIFFERENT FROM THE REST OF THE DEVELOPMENT? 1.3) WHAT ABOUT THE ENVIRONMENTAL IMPACT OF STEEL CONSTRUCTION? The overall recycling rate of steel industry is 66%, the highest of any industry in the country, offering an environmentally sound home framing alternative. Steel framing scrap is a valuable commodity that should not end up in a landfill. Plus many home builders are using our system to build their homes as it is more economical for them and the process from start to finish is very fast. 1.4) WHAT ABOUT THE PRICING? DOES IT COST MORE TO BUILD WITH STEEL? One of the common question we are asked is “How much to build a house in Jamaica, especially with the steel.” …The price of steel has been relatively constant over the last decade. While the price of traditional framing materials has been erratic and growing at a rate much faster than inflation, steel prices have only experienced small quarterly adjustments. Builders interviewed nationwide have affirmed that framing with steel is commonly less expensive than traditional framing. You'll want in-shower storage for your shampoo, soap, razor, and body wash. But hey, you're not in college anymore. Don't settle for cheap plastic units that hang from the showerhead or attach to rods that run from your tub to the ceiling; they look ugly and can ruin your attractive new design. A better option is ceramic tile shelving that's installed in the corner of the shower.